Do you love eco-fashion? Looking for a new career opportunity that is aligned with your values? 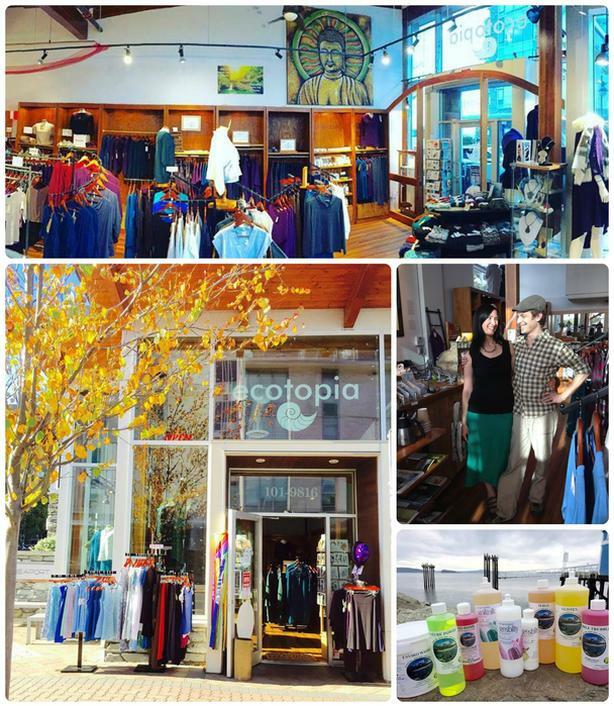 Ecotopia is a well-known store situated in friendly Sidney by the Sea, BC. It celebrates community, sustainability, Canadian-made clothing, local artisans, jewelry-makers & craftspeople. Located in a modern building with high ceilings and large windows, beside the boardwalk, Aquarium, Pier Hotel & Sidney Marina, Ecotopia offers quality goods at reasonable prices. It is also the only authorized Soap Exchange Refill Centre for the Saanich Peninsula, providing biodegradable, non-toxic household cleaning & body care products available for refill. This is a year-round draw, with a loyal following and a steady daily demand. A unique turn-key opportunity, everything is included, for instance a custom made indoor fountain, antique cash register, and gorgeous solid wood cabinetry throughout. It will be easy to generate more revenue for someone with online sales expertise. This utopia for eco-minded luxury lovers has a special charm, smells amazing, and offers a relaxed, peaceful and inspiring atmosphere. With tons of natural light and fresh ocean air, Ecotopia is truly an uplifting place to be. Marketing established includes: Ecotopia logo, website & domain name, customer mailing list, Facebook page, and Instagram following. Since 2011, we've navigated the eco-fashion industry, refined our operating systems, and gathered under one roof the best suppliers, with excellent quality and margins. We've poured our hearts & souls into this business, creating a magical store. With new projects and family calling us, we're ready to pass on the torch. Could you be the town hero who keeps Ecotopia alive? This opportunity is perfect for someone with fresh energy and the passion to carry this vision forward to the next level! Contact Morgan & Mara for a long itemized list of all store contents included in this reasonable and generous package.